Colin Smith of Friends of the Global Fight will be reporting back from the GBCHealth Conference May 15-17 in New York, where hundreds of leaders will discuss what businesses are doing to improve global health—and what they can and should do moving forward. Now in its fourth year, the GBCHealth Conference connects top leaders who recognize that prioritizing health is not just the right thing to do for the world, but the smart thing to do for business. In my work with Friends of the Global Fight Against AIDS, Tuberculosis and Malaria, I get to see that idea in action, made real by people in the corporate sector who are walking the talk on better global health. What I also get to see: there’s so much more that businesses could do—as we all could. The Global Fund to Fight AIDS, Tuberculosis and Malaria, which pools the world’s resources to finance health programs, has counted the private sector among its partners from day one. Innovative models like (RED) and Gift From Africa bring leading companies together to harness financial and in-kind support for the Global Fund. A long list of businesses also lend their expertise, assets, and human resources directly. Many of them will be in the room this week. This year the private sector has the chance—and the responsibility—to step up its game. Since its launch, the Global Fund has supported health workers in more than 150 countries and helped save millions of lives. In the fall, donors will “replenish” the Global Fund with three-year financial commitments. The private sector is one of four pillars in the replenishment, alongside traditional government donors, emerging economies, and implementing countries. A successful replenishment—and success against AIDS, tuberculsosis and malaria—depends on everyone coming to the table. Later this week I’ll be eager to hear from business leaders themselves about what they can bring not just to the Global Fund, but to the broader fight for better health worldwide. I’ll cover the conference from the opening plenary on the Millennium Development Goals until the closing keynote with renowned economist Jeffrey Sachs. And I’ll focus on some important conversations in between, including spotlights on malaria and tuberculosis, a look at digital health & development, and, of course, the role of the Global Fund, among a long list of other topics. Will you be at the conference? I’d love to hear from you. What questions would you ask the panelists given the chance? Let me know. And if you won’t be in the room, you can still follow along and join the conversation on Twitter using #GBCH13. Find Colin on Twitter at @theglobalfight or follow the Humanitas Global Development Blog for updates. Following an introduction by her husband and event chair former President Bill Clinton, Secretary Clinton began her speech, "Designing Diplomacy for the 21st Century," on the subject of change. In addition to global democracy movements, she cited new technologies, demographic shifts and emerging powers, all of which are transforming our world, bringing exciting possibilities as well as great challenges. 1) Continue to move from aid to investment – Many developing countries are improving, and needs for basic necessities aren’t as stark as they once were. So, the U.S. can be a catalyst for self-sustaining growth and economic progress, moving away from direct provision of things like water and food. The Secretary gave examples of successes in countries such as Haiti, where hundreds of jobs have been created through multi-sector collaboration including private sector investment. 2) Emphasize country ‘ownership’ – The U.S. aims for nations to be able to create, implement and eventually pay for their own development plans. Botswana now manages and pays for their national HIV treatment program. And through the President’s Plan for AIDS Relief (PEPFAR), the U.S. is helping facilitate the establishment of a medical school to train the next generation of that country’s healthcare workers. In India when the National AIDS Control Program launched, 50% of the budget came from outside donors, and now the Indian government pays for 80%. 3) “Put ourselves out of business” – Secretary Clinton said that ultimately, development must lead to nations working on their own. “I look forward to the day when our development assistance will no longer be needed” and people have a chance to build better lives for themselves. She said the U.S. is working with partner countries to put special emphasis on self-sufficiency. “For the U.S., as we pursue our development agenda around the world, working to improve and save lives and to spur growth, we’re working to advance freedom and dignity. We’re standing up for democracies that unlock people’s potential and standing against extremists who exploit people’s frustrations.” Secretary Clinton emphasized the importance of the world standing together on this point and did spend a few minutes discussing the recent attack on the U.S. embassy in Libya and the condolences and support expressed from around the world. She said that throughout the week, in which the U.N. General Assembly is held in New York, she has been in discussions with many nations about how to work together to build lasting partnerships. Just this morning the U.N. Secretary General told CNN he'd like to see the U.S. use its influence to try and positively impact world affairs. How can we do so in the most effective, least costly and sustainable manner? In the volatile, untested waters of our changing world, there doesn’t seem to be an easily-defined path. Ellen Johnson Sirleaf, President of Liberia, the first woman president on the African continent, is a plain-spoken leader guiding her country out of years of war with a focus on tough laws and education. Queen Her Majesty Queen Rania Al Abdullah of Jordan, elegant and articulate, said women have opportunity in her country but are still sorely under-represented in the workplace. Muhtar Kent, Chairman and CEO of The Coca-Cola Company, is a business leader working with people in the developing world to foster sustainable communities which represent sustainable markets for the company’s products. The discussion focused on the importance of empowering women in under-developed countries to succeed -- when they improve their own lives, they lift society as a whole. The leaders cited challenges, opportunities and successes. I was heartened to see that while implementing tactics to empower women and sometimes lift them from the darkest depths of poverty and abuse, leaders are also addressing underlying cultural reasons for the “second-class” status of women around the world. At the opening session of the CGI meeting, President Clinton himself said he’d like everyone to think about the reasons why we need to have so many programs to empower women, suggesting perhaps women were still viewed as property in many cultures. President Sirleaf's government is also improving working conditions for women, the majority of whom are independent farmers. Daycare is provided at marketplaces, and the private and non-profit sectors have been mobilized to counsel women on business practices and sometimes even teach them to read. “We need to provide education and access to knowledge, and elect more women leaders." Mr. Kent described the Coca-Cola Company’s successful micro-distribution program, which was started because its delivery trucks could not get to rural communities. The company created micro-distribution centers (MDC’s) where local independent entrepreneurs deliver beverages through alternate means. According to Mr. Kent, they are "flourishing:" “Those entrepreneurs become leaders in their communities, and they now employ an additional 8,000 people in Africa,” he said. Mr. Kent added that Coke has invested $6 billion in the continent of Africa in the last ten years and has ear-marked an additional $12 billion for the coming decade. He said the company is taking the model to other parts of the world, including Asia and Latin America. Queen Rania noted one way to get involved is www.girlup.org, the UN Foundation program where American girls can give a "High Five" to girls in developing countries, donating $5 or more to help provide basic needs like access to school supplies, clean water, and more. On Tuesday morning, President Clinton opened the 2010 Annual Meeting of the Clinton Global Initiative (CGI) and framed the discussions to take place in the coming days. 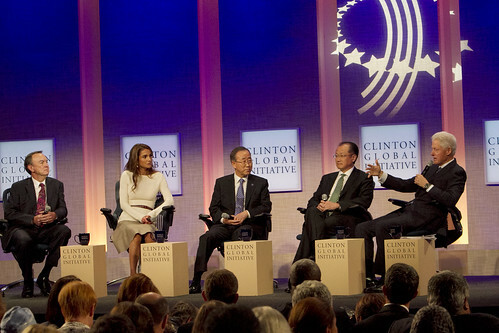 He announced that 67 current and former heads of state, more than 600 business leaders, and more than 500 NGOs and philanthropic and development experts were attending CGI 2010. This week CGI attendees will make new connections, share insights and ideas, and forge partnerships that will strengthen their work. "CGI members come from 90 different countries, speak many languages, work in all sectors, and approach problems in unique ways,” President Clinton said. “But together, their desire and capacity to build a better world for our children and grandchildren has resulted in 1,946 commitments, valued at $63 billion dollars, which have already improved nearly 300 million lives." - Eric Schmidt, Chairman of the Board and Chief Executive Officer, Google Inc.
Bob McDonald reinforced the role of the private sector in development and talked about the importance of any organization to make its “purpose pervasive.” McDonald discussed how P&G lives this philosophy in how they do business and approach social good. McDonald mentioned that 51 of the largest economies are companies, not countries, and 40 percent of all global trade is done by companies, not countries. It was a reminder that while companies must deliver profits to shareholders, and have an interest in building new markets, they also have established in-roads for delivering services and support for public good. We must bring the private sector into the development equation more effectively and substantively if we want to have long-standing and wide-reaching impact. President Tarja Halonan’s Finland boasts among the highest rates of education, economic development and health of any country worldwide. President Halonan highlighted the successful collaboration of her government with Finland’s private sector and NGO community. By having strong public and private sectors, Finland has shown that growth and progress emerge and are sustained in the long run. Eric Schmidt said mobile devices are among the most important achievements in technology, and allow the world to be ONE world. When President Clinton asked about affordability of mobile devices, Schmidt said the prices are getting pushed lower and lower each day. He said the development leaders and governments should embrace mobile technology and digital platforms because they serve as the lifeline of a community. For example, instead of spending money on textbooks that are bulky, expensive, not accessible and quickly outdated, leaders need to look at investing in technology-based platforms for education. Schmidt talked about how after the Haiti earthquake and Pakistan flood, it was mobile technology that served as the lifeline for those affected because mobile phone networks remained operational. The role of women and girls, use of technology and new digital innovations, economic development and creation of efficient public-private approaches to tackle global challenges are CGI focus areas this week. President Clinton recognized that the role of women and girls is a dominant theme at the meeting, and was frustrated by the ongoing violence and abuse that women face worldwide. You can access Webcast archives here. If you didn't catch it, below is last week's guest appearance by President Clinton on The Daily Show With Jon Stewart - a current affairs (with a comedic twist) show on U.S. cable network, Comedy Central. President Clinton talks about Clinton Global Initiative and how Chelsea Clinton's wedding was his contribution to economic stimulus efforts. Good stuff and a good laugh.